Greg Nyquist is a freelance writer and scholar living in California. Daniel Barnes is a businessman living in New Zealand. With a multimillion-selling oeuvre of fiction and polemic, promoted by both her followers and herself as the greatest philosopher of the 20th Century, and possibly of all time, Ayn Rand remains a controversial figure. Yet while both loved and loathed, her work is still too little examined. This is not due to its modest ambition. Many of Ayn Rand’s adherents contend that she is the greatest genius who ever lived, that she almost singlehandedly solved all the major philosophical problems of the last 2000 years, and that the entirety of Western civilisation needs to be urgently recreated in the image of her particular philosophy, Objectivism, if it is to survive. These are the kind of claims that usually attract critical attention. Yet until recently the response had been either superficial, or rather specialised and fragmented, with no comprehensive criticism in the vigorous popular style that Rand herself wrote in. Greg Nyquist’s book “Ayn Rand Contra Human Nature” fills this vacuum. Starting from the key insight that her life’s work was the ‘projection of an ideal man’, Nyquist conducts a blistering examination all the main branches of her philosophy, exposing the immense divide between her romantic rationalisations and the hard empirical facts of reality. Perhaps most devastating of all, he shows how, on close examination, some of the most important doctrines of Objectivism turn out to be little more than empty word-games mistaken for profound insights. This is intended to be a low-volume site. 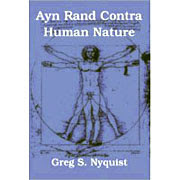 It will over time be updated with condensed summaries Nyquist's book and other criticisms of Rand's philosophy. Time also permitting we will also discuss any reviews or criticism of ARCHN as they come to hand. This is a privately owned blog. It will be moderated occassionally due to a pesky troll or comments spam. While the discussion policy is liberal, I reserve the right to moderate or ban at my discretion. If you don't like being moderated, get over it. It's a big internets, with many other sites where you can express the earth-shaking messages you bear.